Theres a new book on the horizon! Stump the Duct Tape Guys! In stores now! Jim and Tim offer ways to fix everything from broken toasters to broken hearts with duct tape. Proving once again, "It ain't broken, it just lacks duct tape." Or, buy online at the Duct Tape Pro Shop. Click here to redeem the Duck Buck you got with the book. The Duct Tape Guys have done it again! Our fourth Duct Tape Book, "The Jumbo Duct Tape Book" is a massive 464 pages of duct tape wit and wisdom (wisdom subject to change without notice). Published by Workman Publishing, this hilarious collection of duct tape hints is available at your local bookstore or get it online right now by clicking to the Duct Tape Pro Shop. The best feature of this book is the FREE Duck® brand Flat Pack Duct Tape that comes with every book (via coupon). Whether you have their first three books or not, you will definetly want to hook up with this, The Mother-of-all-Duct Tape Books! "We’ve finally (due to relentless and eventually bothersome audience request) put our duct tape stand-up comedy antics on video tape." You can nab The Duct Tape Guy’s video right now online ONLY (not in stores). Just click on the image on the left. Feng Shui Fixed with Duct Tape! 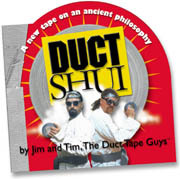 The Duct Tape Guys stumble head-first into the ancient Chinese philosophy of Feng Shui. Totally bewildered, they explore their own theories on how to achieve harmony and happiness through the use of duct tape, thus creating their own breathtakingly stupid philosophy: "Duct Shui". Published by Workman Publishing. Click to DuctShui.com for a brief preview of the book. Beautiful full color - over 101 costume ideas! The Duct Tape Guys’ sixth book is a large format and full color volume filled with photos and illlustrations and offers over 101 clever, creative, and predictably bizarre costume ideas made with duct tape. Click here for a preview sampling from the book. Purchase online at the Pro Shop. A Duct Tape Hint a Day - All Year Long! Since 1996 we have produced the extremely popular Duct Tape Page-A-Day® Calendars with Workman Publishing. Filled with Real and Wacky uses for Duct Tape, these calendars are a great gift for the duct tape user in your life. If you are looking for a daily dose of The Duct Tape Guys' patented duct tape humor combined with real uses from duct tape users around the world, this Calendar delivers! Available at your local bookstore, calendar shop and at the Duct Tape Pro Shop. This calendar usually hits the stores in September.